Mark Twain works are enjoyed worldwide. His real name was Samuel Langhorne Clemens and he was born the 30th of November 1835, in the village of Florida, Monroe County, Missouri. After his father's death in 1847, Twain was apprenticed to a printer and wrote for his brother's newspaper. Later, Twain worked as a licensed Mississippi riverboat pilot, adopting his name from the call ('Mark twain!' - meaning by the mark of two fathoms) used when sounding river shallows. After the Civil War brought an end to the steamboat traffic, Clemens moved to Virginia City. On February 3, 1863, 'Mark Twain' was born when he signed a humorous travel account with his new name. In 1864 Twain went to San Francisco to work as a reporter. He traveled in France and Italy and his experiences were recorded in 1869 in THE INNOCENTS ABROAD, which brought him wide popularity, and made fun at both American and European prejudices and manners. In 1870 he married Olivia Langdon. Together they relocated to Hartford a year later. Meanwhile, Twain continued to lecture in the United States and England. 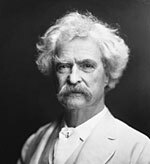 Between 1876 and 1884 he published several masterpieces, including Tom Sawyer, the Prince and the Pauper, Life on the Mississippi, and Huckleberry Finn. In the 1890s Twain lost most of his earnings in financial speculations and in the downhill of his own publishing firm. The death of his wife and his second daughter brough a sense of gloom in the author's later years, which is seen in writings and his autobiography. Twain died on April 21, 1910. A man's house burns down. The smoking wreckage represents only a ruined home that was dear through years of use and pleasant associations. By and by, as the days and weeks go on, first he misses this, then that, then the other thing. And when he casts about for it he finds that it was in that house. Always it is an essential--there was but one of its kind. It cannot be replaced. It was in that house. It is irrevocably lost... It will be years before the tale of lost essentials is complete, and not till then can he truly know the magnitude of his disaster. There are people who can do all fine and heroic things but one--keep from telling their happiness to the unhappy. Loyalty to petrified opinions never yet broke a chain or freed a human soul in this world--and never will. Loves seems the swiftest, but it is the slowest of all growths. No man or woman really knows what perfect love is until they have been married a quarter of a century. Huck, a boy running away from a cruel father, and Jim, a slave, join together to raft down the Mississippi River, both hoping for freedom. A satirical look at conventional views of the afterlife, Captain Stormfield's Heaven allows everyone in. After being knocked unconscious by a crowbar in modern-day Connecticut, Hank Morgan awakens to find himself a member in King Arthur's court. Cathy Allison, a nine year old, is sent to live with her uncle after the death of her parents. After traveling to France, she is made an officer. The story mirrors the tale of Joan of Arc. The story of a Twain's cruise to Europe and the Holy Land in 1867. The son of a female slave who, fearing for her baby's life, switches the infant, the light-skinned boy changed place with the slave master's white son. The story of a boy, Tom Sawyer, an orphan who is growing up with his Aunt Sally. The continuing adventures of Tom Sawyer and Huck Finn. Tells the humorous tale of Twain and his family traveling in Europe during the 1870's.